Did you ever notice how much more expensive your grocery bill is when you have to buy all the cleaning/paper products, and especially laundry detergent? I would always dread that trip, knowing I would spend and extra $12-$17 on laundry soap. 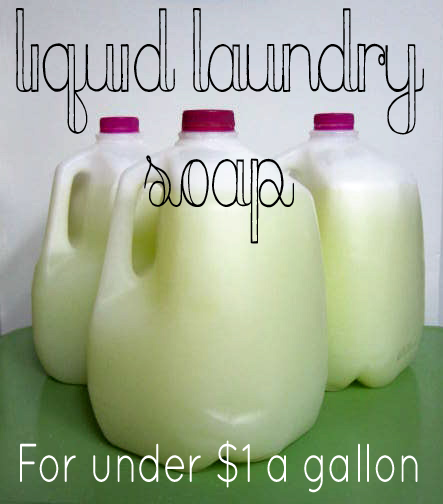 Thank goodness for my friend Tena who shared this liquid laundry soap recipe with me last year. She's been using this for a couple of years now, and neither one of us are even thinking about going back to the expensive stuff with who knows what in the ingredients. This recipe calls for 3 ingredients, plus water, and makes full 3 gallons at a time. I recommend getting a 5 gallon bucket and a paint stirrer attachment for a cordless drill (which only cost about $2.) Our clothes are as clean or cleaner than they have ever been and they smell fresh. You can add essential oils to this if you prefer a certain smell, but I used fabric softener which I think is what gives our clothes a fresh scent. These are the three ingredients that will give you gallons upon gallons of laundry soap. & only 1/3 of a bar of Fels Naptha soap grated. Here is a kit with all three ingredients including three bars of the Fels Naptha. That means one bar of Fels Naptha will make 9 gallons of laundry soap. Start by melting the grated Fels Naptha soap in 3 cups of water on medium heat at a simmer until completely melted. Do not let this boil or it will bubble over! Once that's completely melted, add the Borax and Washing Soda until they are dissolved, just about a minute or two. Then add the melted soap mixture to your 5 gallon bucket filled with 3 gallons of water. Stir it up really good and then let it sit for 24 hours. After the 24 hours, your soap will be set up a little bit. Stir it again really good and then pour into your choice of container. We use old jugs from the distilled water we buy. If you have a large enough space, you could even put this in a pretty beverage dispenser. This is definitely worth doing if you are looking to save money and know exactly what's in your soap! Use about as much as you would with a store bought soap, about a capful. This is a great all purpose soap we used it on everything for over a year, and then Tena brought me another easy recipe to use on whites to keep them super bright. The Bright Whites soap recipe coming soon! I have seen this recipe before...never tried it tho because I use the dry version...same ingredients, just omit the water completely...no melting the Fells Naptha on the stove, you do not mix with water, etc. I have made and used this for years and it's the best laundry soap. We have hard water so we have problems with the dry formula, it will not dissolve in hard water. I can have a 5 gallon batch done and cleanup over in less than 30 minutes. When putting it in jugs or other containers, make sure you leave a couple of inches head room. You MUST shake it each time you use it because it tends to settle. Also, it does not make suds, so don't keep adding more to the wash thinking it needs to have bubbles. use a small amount of sea salt,, salt will soften your hard water. Fels-Naptha is currently being sold in Walmart for nearly $42. Is that right? I don't know the cost of the other items, but nearly $50 for 9 gallons of laundry is going to be really tough on my budget. I bought all three ingredients for less than $7 total at Walmart. The first batch made 10 gallons using 1 cup washing soda, 1/2 cup of borax and 1 bar of fels naptha. I gathered old empty laundry detergent bottles because the plastic is thicker and sturdier. I wasn't crazy about the way it gelled sitting over night so the second batch I only made 5 gallons and mixed very good and poured into the containers while it was warm. Left the lids lose overnight while it cooled. I like that method better. The first 10 gallons lasted me and my husband for a year and a half!! Remember, only used 1 cup of washing soda and 1/2 cup borax. I have enough of that to make many more loads! i got all my ingredients at walmart for like 6 bux, so must of been looking at the wrong tag for the naptha soap. I went to the soap was NOT 42 to 50 bucks, as someone said above! It was 92 cents at Walmart! My local hardware store sold it for a 1.50. I even went to a local shop and purchased some essential oils and added it in during the melting phase. All in all I spent about $20.00 for everything. It yielded me about 8-9 gallons of liquid soap. I used the full bar of Fels-Naptha! I love it so much, I even sold some of my gallons to neighbors and made a quick few bucks! can it be used for the new washers? Is this safe to use in a HE washer? Frontloader? Does it suds much? yes it can, it does not suds up much at all, and allergies from laundry soap are now GONE! where do you get the Fels Naptha? is it available at the grocery store like the other two? Yes, in my grocery store it's in the laundry detergent aisle! This is a great solution to the ecology and economy, plus it is gentler on our skin. I make the dry version and add Washer Whiffs in 'Quiver' scent from Scentsy to give it a wonderful, long lasting scent that even my fussy husband loves! We better watch out--we'll put Proctor and Gamble out of business! For the peson in Ireland, why don't you order from Amazon.co.uk? Pretty sure I know the answer, but is this septic safe? I have tried this recipe and always have had trouble with it coagulating in the container. Do you know how to solve this problem? You just have to shake the jug before each use...which I always did, even with store bought. I make mine with 1 cup each of powdered ingredients, and 60 drops of eucalyptus oil. I have an older child with incontinence issues, and 2 caps of this detergent in a large load of urine soaked clothes and bedding. ..works the first time! I used to have to use 32 oz bottles of hydrogen peroxide, or bleach, and still had to run them through twice...now they come out fresh smelling the first time! I couldn't be happier! Side note...my first batch lasted 3 months, even though we have 5 people (1 incontinent) in our family! Normally, I would have spent $40 in laundry detergent, and $60-$100 in hydrogen peroxide in that amount of time. I decided to buy a nice 5 gal water jug with handle and lid ( I prefer to shake instead of stir) this cost $9. Ingredients cost me $15 ( I bought the eucalyptus oil too) in just the first 3 months, I saved over $100, and I still have enough ingredients for 2 more batches! Next time I won't have to buy the jug either! I love this laundry soap so much. I have used it solely for about 3 or more years now. My recipe is only slightly different, but uses the exact same ingredients. It does clean and remove tough filth far better than detergents. I have allergy to detergents, so it is a live-saver (er, a "skin" saver!) for me. AIt makes a great dry detergent too. For dry, I use two cups washing soda, two cups borax, one whole bar (grated) of Fels Naptha soap. Put the grated soap into the food processor with about a half cup of the dry ingredients and pulverize it into a powdery form. Then dump it into a dry clean storage pail, add the rest of the dry ingredients, stir well and pop a lid on it. You only need one tablespoon of it for a normal large load of clothes. Add the powder to the water before you put the clothes in the washer, You can add a bit more for really grungey cloths. *Yep, you can use some chlorine bleach or oxyclean with it, if needed. You can use also Castile Bar Soap and its all natural as well. I have used this instead of FelsNaptha Bar :) we have brand new grandbaby and I refuse to spend alot of money on special expensive Baby Soap that can still cause reactions ! I love knowing its all natural. And you can make washing soda out of baking soda if ur in a pinch and run out a box of baking soda .50 and you pour onto shallow baking pan and put in oven for 30mins to 2hrs even it wont burn. The temp is 350° on oven. Pink Zote Soap is a good alternative to the fels naptha. Its pink and has a lemony scent that is just divine makes me think of a sunny day :) This is a great recipe for laundry soap! How much of the Zote do u use? Some of the other comments ask if this is ok for HE and frontloading washers. It is. In frontloaders you just have to put the soap directly on top if the clothes instead of in the soap dispenser. This soap doesn't foam up a whole lot which is why it can be used in HE machines. Also, when you stir it up after the 24 hours and put it in bottles, you might notice that it kind of separates. All you have to do is shake it up a bit before you pour some out. Love this recipe! We've been using it for a few years now! However, I am REALLY looking forward to your whites detergent. My only complaint about this one is it does leave lighter colors a bit dingy! I have NEVER had a problem with this leaving the colors looking dingy and I have used this for years and years. Are you adding more than 1/2 cup liquid per load? This could be the reason. Are you overloading the washer? This will definitely have an effect on the way it rinses out. Try rinsing the load a 2nd time and adding 1/2 cup white vinegar to the final rinse. This should take care of the dinginess. I used baking soda once a instead of washing soda. My light colored clothes were dingy/yellowish. Once I switched to the washing soda it's work fine. I have two messy little guys. There clothes come out nice and clean! I've used it for over a year. It is awesome. I wish I'd had this when my kids were babies. It leaves the cloths much softer than reg laundry soaps. It cleans great, and the cost of it is amazing. Anyone that hasn't tried it will be totally amazed at the savings and it's cleaning power. A small tip; For heavily soiled work cloths I double and sometimes even sometimes triple the usual measurement amount to get them completely clean, and its still way cheaper than any other kind. If you have a spot on any clothes you can rub Fels Naptha on it instead of Spray & Wash.
My daughter got several spots of hair dye on a delicate white shirt and I rubbed the Naptha on it. Let it sit a day and most of it washed out. Can barely still see a little bit only if you know it is there... did an awesome job! Has the whites been posted yet? can we use another type of soap? I have the liquid castile by Bronnte I think is the brand. I have not tried any other kind, but if you do, let me know how it works! I have used Zote soap now for several years. I used to grate it and melt same as the Fels Naptha, which I have also used. The Zote now comes in flakes so no more grating. Ready very quickly! I have been using this soap for 5 yrs now. We love it! I have 2 boys and it cleans everything. I have used Ivory bar soap and castile bar soap both work but prefer the fels naptha best. Zote had a smell that way way to strong for my family and it didn't melt and mix well. I have a daughter who has Eczema and everything is clear and free for her. Would this be safe for her. I notice that Anonymous said she used Ivory in place of the Naptha cause of the smell. Like a free Ivory. We use a Dove soap to wash hands with or Cetaphy for her to take a shower. I am not qualified to answer that, I would ask your doctor about the ingredients. This is a recipe I have used for years and we have had no problem. I'm sorry, I'm not familiar with what you have in the UK that would be comparable. Hi you can still buy borax and washing crystals in the UK, they should still be in the laundry detergent section in your super market (Ie Asda) or in a chemist, and use a bar of natural soap, not the sort you would use in the bath, but one you would find in the laundry detergent aisle. Hope this helps. Just made this soap. It has to sit for 24 hours still. I have to say that this will be the first time EVER that I'm excited about doing the laundry :) Thanks for the recipe!!! I'll let you know how it turns out! I have a front load washing machine. I use 1/2 cup vinegar in the rinse cup. This takes all the residue out, and leaves the clothes really really soft. I made this last night, I still have a few more hours until I hit the 24 hour mark for letting it sit, but I'm a little concerned. Only the top inch has gotten thicker. Is it supposed to be a watery liquid, or is it supposed to be a bit more firm?? I followed the directions exactly. That's about right. Once you mix it up it will be a little bit thinner than store bought liquid detergent. I was wondering, can you still use fabric softener with this laundry soap? (I have a front end loader washer) Thanks!! I make the dry version of laundry soap, but would love to try the liquid also. I can't wait for your soap for whites!!! Could you add essential oils like lemon or lavender? I've been making homemade laundry soap for about 2 years now, though it's not this recipe. I just discovered this one today. But yes, you can add any scent of essential oil(s) that you like. You might even try mixing scents. But be careful not to add too much oil. I'm not sure what it might do to your clothes. The recipe I make is supposed to make 10 gallons, but seriously! Who just happens to have a 10 gallon bucket just laying around. So I mix it in a 5 gallon bucket and call it concentrated since I'm cutting the water in half. I usually do about 10-15 drops of oil for that bucket. But you can add as much or as little as you'd like, depending on your preference. :) I hope that helps. Can you store this in an old detergent container with the dispenser if you clean it out good? I store mine in old detergent containers. I've been using this for a couple of months - one nice side effect is I don't have to use fabric softner anymore, my clothes are soft and static free now. I cannot find Fels Naphtha soap, would Zote work just as well? Zote works just as well..
What´s the difference between washing soda and baking soda?? Been using a similar recipe for 6 months or so and we love it. We have 10 children and the savings is significant! We use a blender after the initial 5 hours or so and it whips the detergent so it no longer separates. The end result is a mayonnaise like texture. We have experienced increased static and have had to add a softener. Will be trying the white vinegar in the rinse cycle. Thank you for sharing all your tips. How much fabric softener do you add to the laundry mix to make it smell good? I don't add it to the laundry soap mix. I just follow the directions of the fabric softener. I've made this and it's just the best! Since I have sensitive skin, I love knowing exactly what's in my soap. And...not more itchy skin! I also add 1/2 cup of Arm and Hammer Baking Soda. I get a huge bag at Sams. I also check prices for Borax and Arm and Hammer Washing Soda. I also have used Kirk's bar soap. The one problem I have had is I can't get the bar soap grated small enough to not dissolve. Pretty neat. I shall save this idea for in the future when I have my own place. For now though, I go to Big Lots and get a bottle for under $3 that gives me 50 loads. I'm sure it has who-knows-what in it, but I'm a guy so softness or longevity aren't my biggest concerns (I always buy clothes on discount too). to Anonymous from IRELAND (4/26/2014), needing information on purchasing soap ingredients: get BORAX at the chemist; get SODA CRYSTALS at ASDA; you should be able to purchase Fels-Naptha at a larger grocery....if not, try a hardware/home improvement store like maybe B&Q, Woodies DIY, etc. You can substitute any non-deodorant soap (Sunlight, Ivory, etc) for the Fels-Naptha. Hope this is helpful; we left Ireland in 2009 so I'm going from memory here. Best of luck! Just made some of this. It works great and smells so fresh. Washing soda IS different from regular arm and hammer, but they make washing soda as well. You might be able to find it at Walmart or a similar store. Borax and fels naptha (please see my comment below on FN, though) are usually found in the laundry aisle, as will the washing soda if they have it. I have made the dry mixture and the fels naptha was grated on a microplane. Whole house smells great after mixing this. I wonder if the naptha dissolves in cold water wash temp. I add one capful of detergent from the dollar store to each gallon to boost the ingredients and encourage them to dissolve better. I have been making this detergent for years. It took all of the residue off of my washing machine and presumably from my clothing as well. i have been using a homemade laundry soap recipe for over a year now, i love it. i have discovered that i loved it more when we had a traditional washer. my laundry was bright and the whites became whiter, it was clean and fabulous !!! BUT when our regular washer died, we bought a new HE washer and i am very disappointed in the washer. ugh. i can't stand it really. i have had to adjust the ratio of water to the amount of soap to find the same results and its been frustrating !!!! the new washer uses less water and you cant 'soak' things so i dont think the soap gets distibuted thru the laundry as well as it should and is not as effective. I know what you mean about the new HE washers. We are also disappointed. Besides the fact that we paid a lot of money for our set, our clothes do not get clean. I haven't tried this laundry soap recipe yet but I am going to get the ingredients today. Hope we have better luck. Had considered getting rid of the washer but will try this soap recipe first. I'm glad I'm not the only one disappointed with my front loader AND my water saver top loader! Honestly did not realize how badly they cleaned my clothes until I went back to a "normal" washer. I can't wait to try this recipe, I'm hoping that it will be better for the ejector pump system that our basement uses to get water to the sewer. We've had to replace the float 3x in the last 5 years and the plumber says it's because of using today's detergents. Apparently they gunk up on the rubber membrane of the float (pressure switch) and cause it to fail. $45 for a small bar of fels naphtha soap is not correct. Please note the size of the bar in the photo, it should cost about $1, $2 at the most. Ruth Moshier - I am not happy with my HE either, same reason! How do you adjust the water level? I've been using the dry version of this soap but I think switching to the liquid form would solve the problem, what do you think? Read your buttons and you should be able to see how to adjust water level. Some He machine do a sensor read to what was loaded in. Also, if your washer has an odd odor leave door open for about 30mins, which is a lot cheaper than the stuff Tide sells. i'm getting ready to make mine up, but my question is, how can only using a 1/2 cup of each of the powders to make 9-10 gallons of liquid soap when on the back of the boxes says add a 1/2 to the regular detergent for a load of clothes, so how good is it gonna be only using 1/2 cup of each for the amount this says for the recipe, and what thickens it? Melted fels naptha will thicken it. You will have to shake it a little each time because it is very thick. If you read the recipe at the beginning the 1/2 cup of each powder and 1/3 of the bar heated with 3 cups water then added to only 3 gallons of water Not 9 gallons. I have seven children and one with skin allergies. I use to have to buy two separate bottles of laundry detergent at least every month. I just make this recipe and save a load of money, and it lasts us months. I will agree it is not Tide but who wants to spend almost 20$ on a gallon of that. Need money use this recipe! I just made my second batch of the soap and I had to post my comments. I love this soap!!!! It smells so good....fels-naphtha is amazing! Our clothes are clean and so incredibly soft! I never realized what commercial detergent could do to fabric. Other benefits? My daughter's body acne is clearing up and my son's eczema is non-existent! We do A LOT of laundry at our house...between 8 and 10 loads a week for our family of six. I was buying a 96-load jug of Tide every two-three weeks (that small load amount just didn't cut it for clean clothes). What a waste of money! Yes, we've gone through three gallons of this homemade detergent in just under three months, but it is an incredible savings! My mom thinks I'm crazy and she continues to swear by her Tide. Not me anymore. I love the whites detergent as well...my whites are bright and clean, no more dingy! Thank you for Shari g this recipe and helping me in my quest to save our family money, help the environment, and be healthier! I'm so glad I found this recipe. I was grating soap to make powdered detergent, when my 2-year-old dumped some water into the bowl with the grated soap! I decided to take my lemons and make lemonade - or in this instance, take my wet laundry soap and make liquid detergent. :) My detergent is setting right now. I'm hoping this will actually work better than the dry detergent, sometimes that doesn't dissolve all the way in my washing machine, and that won't be an issue with this liquid detergent. Anyway, thanks for the recipe! So sorry that you are stuck with the HE washer. I was super lucky to hear from the repair man to get the Speed Queen commercial heavy duty , super capacity, that's all available, but only for this year. It cleans like the old washers. You can adjust the water levels, soak cycle, second rinse etc. Love it! Thanks for the recipe, making it today. Where do you put the soap in a front load, HE washer? Soap dispenser or drum? I have been making this for a while and love it. I make a 5 gallon bucket at a time. That will double to 10 gallons. I Like the liquid much better. This is such a great post and great idea! I am so glad I read through the comments as well cause I was going to ask about adding baking soda. I spend so much money on laundry soap. This is an awesome frugal tip!